Editor’s Note: Adobe has announced Creative Suite 3, a massive overhaul to its applications for creative pros. Before the software bundle ships in April, we’re taking a closer look at some of the applications that make up Creative Suite 3. This installment previews Photoshop CS3. 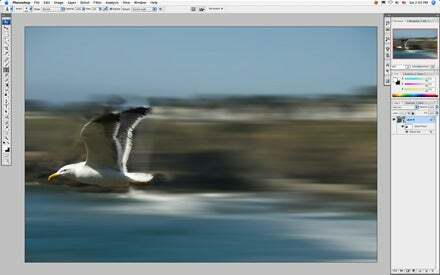 Since last December, thousands of digital imaging thrill seekers have had their own first look at Adobe Photoshop CS3 —according to Adobe, more than a half-million people have downloaded the first-ever public beta version of the image editor. But the public beta version lacked some features that will be in the shipping version, due next month. I’ve been working with a near-final version of Photoshop CS3 in preparation for a forthcoming review of the shipping version. My initial take: CS3 is the best, most powerful version of Photoshop yet—but there’s room for some refinement. The biggest news for Mac users is that Photoshop CS3 is a Universal Binary and thus runs dramatically faster on Intel-based Macs. Macworld Lab will be testing the final release, but even tests performed on the public beta showed significantly faster performance. And as an owner of dual-processor, 2GHz Power Mac G5, I can report that CS3 runs well on older systems, too. Photoshop’s overall look and feel are unchanged, as are the vast majority of the keyboard shortcuts that Photoshop users perform in their sleep. Still, Adobe has given Photoshop a modest face lift, adding docks that hold the program’s many palettes (now called panels). You can hide and show docks with a mouse click or keystroke, or set them up to disappear and reappear when you move the mouse toward the edge of the screen—much like Mac OS X’s dock. Alas, you can’t create docks on a second display. You can move panels there, but you can’t create a dock to hold them. As for imaging enhancements, they’re here in spades. They begin with Camera Raw 4, the latest version of Adobe’s raw-format conversion software. Camera Raw 4 (also included with Adobe’s Photoshop Lightroom ) provides far more control, from an enhanced curve editor to new sliders for fine-tuning lighting to new monochrome conversion tools. There’s also a non-destructive clone and healing brush tool that’s ideal for cleaning up sensor dust spots. And in a first, you can now open TIFF and JPEG files in Camera Raw and apply its tools to them. A new Quick Selection tool lets you make selections by simply painting across image regions. You have to do some fine-tuning when selecting objects that have similarly colored backgrounds—the Quick Selection tool is easily led astray by similar colors—but the new tool gives you a better head start than the Magic Wand tool ever did. A new Refine Edge command replaces the Feather command and provides excellent control over selection edges, enabling you to expand and contract them, for example, as well as preview the results. You can also apply the Refine Edge command to layer masks, which greatly aids advanced compositing and masking chores. Photoshop CS3 also makes it easier to go gray, thanks to a new Black and White adjustment that gives you precise control over how the image’s colors are converted to black and white. Several presets simulate a variety of photographic filters, and one even provides a reasonable simulation of infrared film. (Adobe added similar presets to CS3’s enhanced Channel Mixer, which had been the previous tool of choice for black-and-white conversions.) And a new “eyedropper scrubber” lets you click and drag directly on your image to refine the conversion of specific hues. Using it feels much more natural than typing numerals or dragging a slider. With Smart Filters, you can selectively apply filters and change their settings later. Here, I applied the Motion Blur filter to the image, then painted on its layer mask to remove the blur from the flying gull. Photoshop CS3 takes another step toward non-destructive editing with the new Smart Filters feature, which lets you apply filters without altering the underlying image data. As with adjustment layers, you can use a layer mask to selectively hide a filter’s results—for example, you can apply a blur filter and then paint on its layer mask to restore sharpness to parts of the image (see screenshot). And as with adjustment layers, you can change a filter’s settings or remove it entirely. There are dozens of improvements small and large in Photoshop CS3. The Curves dialog box provides more control over image tonality and lets you save presets that you can apply to other images. A new Clone Source panel works with the clone stamp and healing brush tools to greatly simplify precise retouching. For example, you can activate an overlay that shows exactly what you’re cloning and where. The new panel also expands your creative options. You can, for instance, specify that a cloned object be scaled and rotated: turn one balloon into a dozen, each a different size and orientation. Photoshop CS3’s Photomerge stitching feature does a far better job than CS2’s, with smoother blends and more control. And speaking of alignment, new layer-alignment features let you place multiple images on separate layers and then have Photoshop align them. It’s a great way to take several photos of a group shot and combine them to capture the best facial expression from each member of the group. Photoshop CS3 also sports a kinder, gentler Print dialog box that offers a reasonably large preview window and the layout controls that used to be present in the (now gone) Print with Preview dialog box. There’s much more in Photoshop CS3—including an entirely separate version, Photoshop CS3 Extended, which adds sophisticated video and scientific-imaging features. We’ll cover this version and the rest of Photoshop CS3’s enhancements in our formal review of the shipping product. It’s obvious that Photoshop CS3 is the most powerful version of the image-editing app to date. But there is some room for interface refinement. While the docks are a nice enhancement to Photoshop CS3’s interface, the program hasn’t gotten easier to use. Indeed, there are now more ways than ever to accomplish similar tasks. Black-and-white version is a good example: do you use the Grayscale command, the Black and White adjustment, the Channel Mixer, or the Convert to Grayscale option in Camera Raw? And the controls themselves for each of those functions are often inconsistently named. Maybe that’s just the nature of the beast: Photoshop may be too deep, too versatile, and too feature-rich for a one-approach-fits-all design philosophy. But after being spoiled by the interface elegance of Adobe Lightroom and Apple’s Aperture, it’s tempting to wish for some similar tidiness in Photoshop’s interface.